This environmental quality certification was obtained thanks to FIBBA’s compliance in the fields of Integrated Water Management, Integrated Waste Management, Urban Infrastructure and Natural Resources. 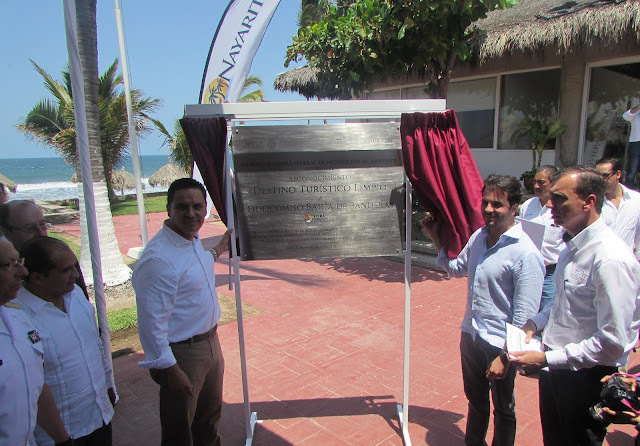 Rafael Pacchiano Alamán, head of the Ministry of Environment and Natural Resources (SEMARNAT by its acronym in Spanish), presented Roberto Sandoval Castañeda, Governor of Nayarit, a certification naming Nuevo Vallarta a “Clean Tourism Destination,” making it the first in Mexico to receive this environmental recognition. Nuevo Vallarta is operated by the Banderas Bay Trust (FIBBA, by its acronym in Spanish) and it was there the formal act took place along with the unveiling of the plaque on Thursday, May 19, 2016. “I would like to extend my sincerest congratulations to the Trust and, of course, to don Carlos (Rosales) for his leadership, as well as the State Government and the municipality of Banderas Bay for having gone above and beyond the requirements of the law,” declared Pacchiano Alamán. “Today Nayarit has stood tall and demonstrated that, as a tourism destination, our interest is to always encourage development without forgetting about the environment,” said Roberto Sandoval as he recognized the work of the FIBBA staff and the authorities of the three levels of government. Guillermo Haro Bélchez, head of the Environmental Division of the Federal Attorney’s Office (Profepa, by its Spanish acronym); José Luis Mario Aguilar, top official of Mexico’s Secretariat of Tourism (Sectur); José Luis Mario Aguilar, Mayor of Banderas Bay; José Gómez and Carlos Rosales, director of FIBBA, as well as the state delegates of Profepa and Semarnat were all present at the event. Before the event a Business Meeting was held with the Tourism Sector of the State of Nayarit, where Fernando González, the president of the Banderas Bay Hotel and Motel Association (AHMBB by its acronym in Spanish), presented Rafael Pacchiano Alamán with the letter of intent that manifests their interest in promoting and encouraging the participation of the unions that form part of the AHMBB into the National Environmental Audit Program.